Karl Dean and his administration REALLY don’t like it when someone pushes against their agenda, and they have been clear that they will do almost anything to challenge those who question their wisdom. Councilman at Large Jerry Maynard experienced this when he pushed hard on the administrations stated (at the time) intention of closing down Metro General and found his career in jeopardy when certain unnamed sources questioned his ethics (something that quickly made Jerry never put himself in that position again). Emily Evans experienced some of this when certain sources suggested that her opposition to the Convention Center was based in her desire to run for mayor, a suggestion that Emily continues to laugh at. Duane Dominy is just the latest in a line of persons to find their hands slapped, with the administration making suggestions about intentions rather than fully addressing the raised concerns. Apparently the opposition to the fairgrounds proposals must be getting to the administration, for today they not only put on a full court press with a statement of support from the Nashville Chamber AND hiz honor himself, talking to the press in a controlled press conference before a local press that that seems dazzled by his smile. But here is the problem . 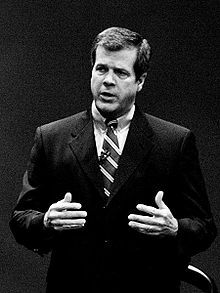 . . something we discovered in the English Only campaign with Mayor Dean went on Lou Dobbs to “debate” Councilman Crafton (one of the worst performances by a sitting mayor I’ve ever heard) . . . he sometimes doesn’t fully recognize what he’s saying. That last sentence (which I am emphasizing) is interesting, for in essence what Mayor Dean is saying is that the needs and desires of the client base that will serve as the primary clients for the Expo Center don’t MATTER! Regardless of what one thinks about Councilman Dominy’s connection to this legislation in regards to his political race, does it really make sense to criticize the potential clients for a project that we want to succeed? And isn’t it the case that we should WANT to entice vendors from out of town so as to expand our tax base? After all, Mayor Dean wants out of town corporations to relocate here if the property is redeveloped. Even if the project is moved to Hickory Hollow, does it really make sense to imply that the potential vendors of that site really are unimportant and that their concerns shouldn’t be addressed? Or consider the very last thing that Hiz Honor said to close the press conference, a statement than he went out of his way to make after his handlers had ended the event. Dean jumped in to say one more thing before media members left. He again made his case for redeveloping the site, this time pointing to what he’s observed to be an inactive site. “Six out of seven days, there is nothing going on out there,” Dean said of the fairgrounds property. Uh, excuse me your honor but part of the sales pitch for the move to Hickory Hollow is to revitalize that space and create the opportunity for more business in the other parts of the mall. Now you are saying that in fact it really won’t make a difference in the Hickory Hollow operation because nothing really goes on at the Fairgrounds anyway most of the week. So what you are asking the people of Antioch to embrace is another empty big box store through the week and impossible parking in the primary retail center on the weekends. And by the way, your tally is off because as I read the schedule on the current expo center web site (something you may want to look at some time) every Friday, Saturday, and Sunday through March is booked, meaning that three days out of seven, there are activities at the Expo Center. The fact remains that the mayor has decided that they want the current property to be a jewel in their redevelopment plans, and they are ticked off that anyone would question their sterling wisdom. And, as this administration has been known to do in the past, they will use any and all methods (including the stellar hatche . . . uh . . . public relations work of folks like Dave Cooley) to get their way. But when the mayor dismisses the client base for the project he is selling, and suggests that “…nothing is going on out there…” he clearly telegraphs to the rest of us that our opinions don’t really matter . . . something that hopefully will be remembered in the weeks to come.